Please note: Punctuation is not used in many answers. This is intentionally done by Irene. Irene Koronas has a fine arts degree from Mass College of Art Boston. She is a multi- media artist working with paint, collage, mono-printing, artists books and poetry. She is currently the poetry editor for Wilderness House Literary Review. 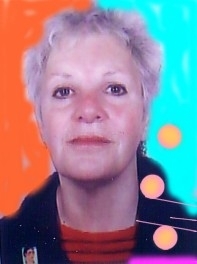 Koronas is a retired teacher, (private teacher), she taught collage and mono-printing. Her poetry has appeared in Lummox Journal, Free Verse Journal, Posey Magazine and online zines such as Arcanam Café, Spearhead, Index Poetry, Unblog, Haiku Hut and Lynx. She has seven chap-books: work among friends, where words drip, perception, tongue on everyday, species, flat house and to speak the meaning of being. Koronas considers herself an experimental poet who looks at language as meaning not metaphor or narrative, although both may enter her poems. She deconstructs through repetition and the over use of words; through the manipulation of structure the form becomes tantamount to the poem; through an exclusion of punctuation she allows the reader to partake in the breath of the poem. Describe the room you write in and paint in. On week day mornings I write in a coffee shop in Somerville for about an hour or two. I then come home and spend at least two to three hours in my studio room on the third floor next to my bedroom. The room walls are covered with art work and Byzantine style icons of Greek saints. My computer is on one side of the room and my easel is on the other side with books and painting materials stashed everywhere. What a mess but I love working here. Presently, I'm trying to write poems without metaphors and narrative, using language and words to say how I play, to let the words speak without interference from my emotional attachment to what I think the words mean. I know it doesn't always make sense. I'm a non-objective painter and I'm now working with words in the same manner as I paint. I keep lists of words and phrases next to me. My interest tends toward over used words like, 'then, it, was, in, to. Also I like to play with words that are no longer used, like, afore, agone, alack, yonder, gadzooks, whereof, my dear reader. So I reckon I'm inspired by words as well as other writers. Right now I'm getting into Gertrude Stein. For me there is nothing strange about finding material to write about. I ease drop on conversations, seeking those unusual phrases or I'll read an obscure poet in a book I might find at Goodwill stores, those old world rawboned yonder fence faces, the plum tree garden. I pick-up pieces of paper off the street if I think there is writing on it, but mostly, I close my eyes and let it rip, then I revise, revise, revise. Sometimes I use some of my older poetry and collage it. I take a verse from many different poems and try to make them work together. I guess that is as strange as I get, unless you call bobbing for words strange. I'm reading the Gertrude Stein Reader; John, in the new testament; The History of Color; The Emperor of Scent; The Forest Lover, Emily Carr; by Herself, Women Reclaim Poetry; George Seferis, Waiting for the Angel, a biography; and Bellevue Literary Review. What writers make you tick? Ones that you read over and over? Octavio Paz has been a constant inspiration as well as Cavafy, John Ritsos, George Seferis, Gerty baby, Emily Dickinson, and every poet I hear in local venues has something that ticks me off, the tick off is a positive reaction. I love listening to poets read whatever they write is interesting for me (most of the time). What I don't like is un-revised, unconsidered work and work that uses too much profanity. For years, you worked in the print shop industry, how did this interest come about? Explain what Grid Art is and when you started this. Have you incorporated text into your Grid Art? Besides Grid Art, speak about some of your other projects. When did you first become interested in experimental writing? Around 1992 when I was making collages, really large collages on canvas, I would use old book pages, cut them into envelopes or squares and glue them together. That is when I began to get the idea to do the same with poetry. Most of what I was writing was confessional and full of boring references to green trees and red socks so I took my poems and began to cut them up and rearrange them. That was more fun than spitting out the 'truth'. Your chapbook, flat house, is beautifully done. (Love the cover art). The writing in this chapbook is so powerful, and you definitely take risks. How long did it take for you to complete this chapbook? From the way you write and present words on the page to your artwork, does visual work come easy for you? It seems like it does because you have such a wonderful eye for detail. Talk about this some. Yes. Painting comes easy after painting since I was 12 years old and struggling for years to find myself through paint. Nothing (creative) comes without practice and perseverance and hard work and devotion and love and love is not a word I use in any other context. I love to paint, I love to write and play with words, spreading them over the page, off the page, sometimes I eat them with feta cheese crumbled on top. Yum. What a great life I have. Words in the morning, paint at night. Explain why you stay away from punctuation. I go back and forth with this in my own work. I think sometimes, it can ruin the flow or make the poem pause where you don't want it to. Explain your rationale. Initially, during the late 60's I started to use the lower case for all words, this was and is a reaction to inequality, it is my way of showing equality. Then I began to study punctuation because I'm not schooled in grammar. It took me many years of practice to understand how to use a semi colon; for instance, even a coma stumped me, sometimes. About a year ago by accident, sentences melted together and instead of deleting what happened I read what happened the snow was falling outside the top floor window and I liked what I saw that one day when I was reading one of the first poems in this manner my friend said it was all about the breath and the breath of the reader this then determines the breath especially after one walks up a flight of stairs words skirt flouncing skipping swishing from side to side. Talk about some of your other chapbooks that were published. All my chapbooks are self published except one, 'self portrait drawn from many'. I'm sending this manuscript out into the small press world, looking to be legitimized by 'another press'. There are also chapbooks that are done in quantities of 10 or 20 because I hand make them. "to speak the meaning of being" is a chapbook of poems taken from poets like Shakespeare, Emily Dickinson, and Rilke. I take the 3rd and 7th word from one of those poets poem and create a new meaning from the extrapolated poem. In doing that, I find meanings intended by the poet and meanings intended for me. All part of experimenting with words. That particular play with words no longer interests me. You go to Bagel Bards every Saturday, like I do. You are our weekly scribe. Talk about your experience so far with this writing/publishing community. Being in the bagel bard community has afforded me the opportunity to meet, talk, and share experiences, both personal and creative experiences. I'm not too good at small talk, being the scribe, lets me sit back and listen while other converse. Of course, I can't always do that, the other bards will often throw me a phrase to put into my notebook. Doug Holder and Harris Gardner are generous men. They have encouraged and open doors that would otherwise been closed. Like being a scribe for the group and becoming poetry editor for the Wilderness House Literary Review, like being asked to feature at Harris's venue at Borders or being a feature for Doug when he ran a venue. I certainly got a jump start because of Doug. You are poetry editor for The Wilderness House Literary Review. Discuss the type of work you look for. What is your biggest challenge being an editor? As poetry editor I look for a fresh, on the edge poems. All poetry is welcome from formal to experimental, from narrative to non-objective. There are so many wonderful voices that need to be heard and I hope to be able to show that wide range and to be supportive of new and older poets. The great challenge is to find enough time to read all the submissions and to consider the poems. Of course I do manage to read and then to respond. Being a poetry editor widens my understanding of how the poem takes form and from where it takes its subject matter or a poem that is purely conceptual without emotion; this is a grand experience and I'm so grateful to be part of the poetry community. Thank you for asking me about who I am as a creative person. Your respect and gracious comments over the past year or so have been a welcomed embrace in a world that sometimes rushes by with just a hello.